Admiralty House in Pembroke was once the home for admirals of the British Royal Navy. Little remains of the mansion today except for a derelict ballroom and a few outhouses. Since the 1970s the grounds have been a public park. The park is stunningly beautiful, but is rarely visited by tourists. The hillside park boasts fantastic ocean views, shaded paths, wooded areas, and a tennis court. A meandering path leads down to a sheltered cove. Clarence Cove is one of the smallest beaches in Bermuda but shouldn’t be overlooked. Its calm, shallow waters are crystal clear and ideal for children and snorkelling. A dock runs along the northern end of the cove and is a popular spot for local children to dive from. You may also see scuba divers training here. One of old buildings in the park is now the headquarters of the Bermuda Sub-Aqua Club. An interesting feature of the park is the many caves and underground passages here. Many were built by Thomas Cochrane, Admiral of the Royal Navy’s North American and West Indies Station in Bermuda between 1848 and 1851. A large cave near the cove was built as a unique diving room while an underground tunnel near the tennis court supposedly served as a discreet entrance for his mistress. The park is situated in the Spanish Point area of Pembroke Parish. It’s not listed in many of the major guidebooks and there’s little tourist accommodation in this area so it’s rarely frequented by visitors. Come midweek during term time and you’ll probably have the place to yourself. 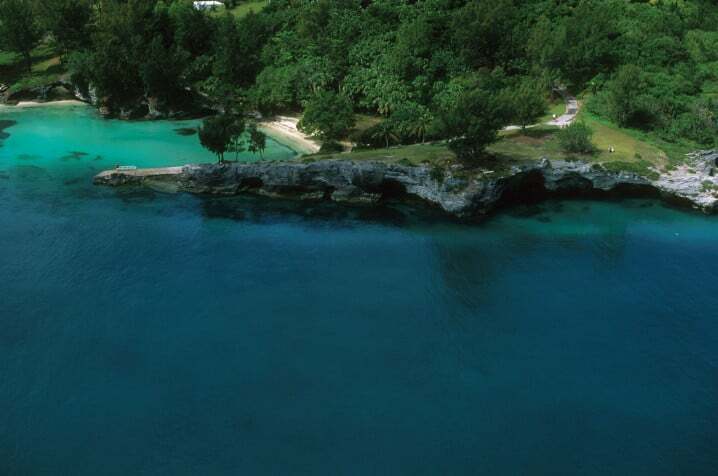 Admiralty House Park and Clarence Cove are situated off Spanish Point Road, around 2 miles from the centre of Hamilton. Bus number 4 stops right outside the entrance. Admission to the park is free. Like all parks in Bermuda, it’s open daily from sunrise to sunset. There are no facilities here and no restaurants or cafes nearby. Deep Bay lies to the east of Admiralty House Park and is popular with cliff divers and climbers. The Pembroke Community Club and the skating rink of the Bermuda Inline Hockey Association are also nearby. 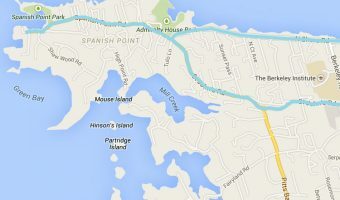 Map showing location of Admiralty House Park & Clarence Cove. I would like to know Admiralty’s address. Thanks. It’s on this page. Below the map. Admiralty House Park is worth a quick visit. It’s quite small with lots of interesting caves and tunnels. There were lots of local kids there jumping off the rocks. We didn’t see any other tourists but not surprising as it is well off the beaten track. Guide to Pembroke Parish. Includes places to stay, tourist attractions, restaurants and pubs, shops, how to get there and around, a map, and more. Buses on this route travel from Hamilton to Spanish Point in Pembroke Parish. Places of interest on the route include Admiralty House Park and Clarence Cove.